The Casimiroa is a native of the Mexican highlands and as a result is fairly hardy. It has been recorded as surviving temperatures as low as -5 degrees Celsius. Rutacea - same family as citrus fruit, it is reputed to be one of the heaviest bearing of all fruiting trees, although this depends on variety selection. Some selections grow very large, but for the home garden incredible edibles®'s is propagating smaller growing self-fertile selections as much as possible. Grafted plants tend to be smaller growers than their seedling counterparts. Plant in the corner of your section as a shade tree, a stand alone, espalier, a backdrop to a hide a fence or for pleaching (hedge on stilts) to create privacy. Highly nutritious, and rich in vitamins, including A and C.
In prepared dishes, Casimiroa is frequently combined with milk to produce ice creams, milk shakes or pies. With added lemon or lime juice, the fruit makes a good jelly, and also sherbets. 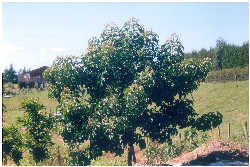 Casimiroa trees fruit prolifically and a healthy mature tree can produce 1000 fruit per year. Young trees will need to be protected from wind. 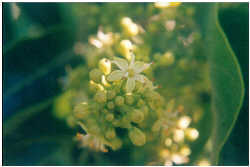 The Casimiroa will tolerate drought conditions but requires moisture during late summer for good fruit set. They will grow in most soils including clay, but prefer a well-drained sandy loam soil with a pH between 5.5 and 7.5, but the tree will grow in almost any soil as long as it is well-drained. Although Casimiroa can withstand more frost than an avocado they should be protected while young. They do not need as much fertiliser as a citrus does. Too much fertiliser results in excessive growth and reduces the fruiting for a year or two. An annual application of Dolomite has been found to be beneficial to prevent magnesium deficiency. Young trees tend to form whippy growth, which should be discouraged by summer pruning. Remove about 1/3 of the current season's growth in mid January. This trimming will encourage more branching and twiggy growth, which will mature as the tree grows and begins bearing fruit. If you are really keen to experiment, it might be worth training Casimiroa as an espalier or a garden specimen. Hard pruning at any stage will result in even more vigorous growth at the expense of fruiting. Bait for snails, as these relish young Casimiroa foliage. A similar spray program to that of citrus with a copper and oil cycle will control any other likely pests. Avoid applying copper or oil to new growth or when trees are in flower. Casimiroa are resistant to Armillaria and Phytophthera, two root diseases which can plague fruit trees such as avocado and apples. Casimiroa are rewarding to grow and seldom bothered by pests and diseases. When planting your Casimiroa choose a site where the falling fruit will not be a problem. As a lawn specimen they make a nice shade tree for summer picnics and the fruit that is not used is automatically disposed of with the lawnmower.